Towels look and feel best when you know you’re getting the best materials out there. That’s why we’ve taken the time to research and hand select the best towels made in the USA. Check out our top recommendations, tons of details about each one, and the factors that went into our research below. While looking through some of the top towel brands that U.S. brands have to offer, we were especially impressed by five brands. 1888 Mills for its luxuriously soft towels and the wide range of color options offered by Martex Supima Luxe towels were a couple of the standouts. We chose each of the towels on this list for exceling in one specific area, which should help you choose the best towel for your own personal needs. Below are tons of details about each one of our top recommendations, along with what we liked and didn’t like about each one. 1888 Mills is a well-known company that specializes in soft and durable bath towels. The 1888 Mills 100% organic cotton towels are particularly soft because they are made from highly absorbent combed cotton. These towels have a tough two-ply construction and are made to withstand repeated use well. They are simple in appearance, but have a plush feel that stands out. 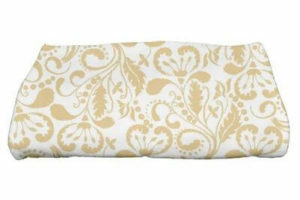 They’re more comfortable and luxurious than most hotel towels and will quickly become the centerpiece of your bathroom. Breathe life into your bathing space with these elegant O’Connor bath towels. They feature attractive floral patterns and come in three different colors. Choose between yellow, orange and blue color finishes. We love that these towels are made in the USA and that they are hypoallergenic. They are made from 70% cotton and 30% polyester blend and offer a soft touch feel with excellent absorbency. The towels are plain on the back, giving you two different looks to work with. Soft and plush, the Martex Supima Luxe towel set makes a luxurious addition to any bathroom. Each of the towels in this set are made from 100% cotton and we found that they get even thicker and softer after the first wash cycle. These towels are carefully stitched for maximum strength and they have a simple design that will blend with most bathrooms well. We love the wide selection of color options, making it possible to choose between a deep garnet red, navy blue, white, and other brilliant colors. 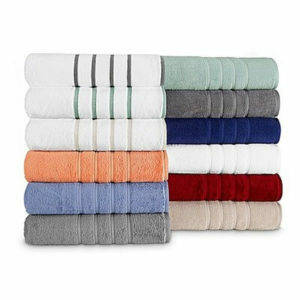 Choose from one of the many different sets available for these towels, and they are pretty affordable as well. 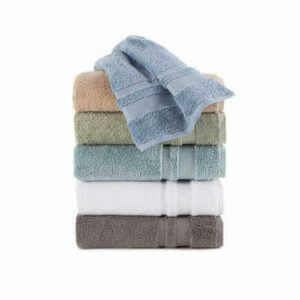 We like how easy it is to mix and match these high-quality towels to get just the colors that you want for your home. Each of these towels from American Craft are made from 100% cotton. They are sourced, sewn and manufactured in the USA. These thickly stitched towels are designed with durability in mind and hold up well through regular use. These towels are thinner than some of the others we reviewed above, but are still very durable thanks to the attention to detail in the quality stitching. Started in 2011, Towels by Gus is making some of the highest quality towels on the market right now. 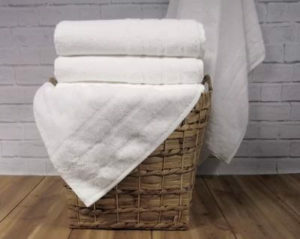 These top quality ringspun towels by Gus are made from 100% cotton and manufactured in Griffin, Georgia. We love the tough single hem border that wraps around these towels and they’re fluffy look and feel. 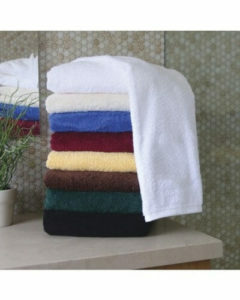 The towels are made from loose-knit cotton which helps make them particular absorbent for effective use. They should be washed and dried before the first use for the best performance and longest durability. When selecting our top picks, we focused heavily on the feel of the towels. High quality towels feel heavier than standard towels do. They are made from tightly coiled fibers and have a dense feeling that low quality towels simply can’t emulate. Of course, we select towels based on how soft they feel as well, but always look for a tight, dense and heavy feeling first and foremost to ensure high quality. While examining towels, we looked closely at the stitching used around the hems. Each hem should be double stitched with heavy stitching for maximum strength and durability. Heavy stitching reduces fraying and problems with wear over time. The best towels should be durable and soft to the touch, but they should also come in a variety of looks so you can complete your bathroom design. We looked for towels with interesting floral patterns or neutral towels with a wide variety of color options to select from. When choosing towels, we looked for mostly cotton construction, tight loop patterns, and thick and heavy fiber construction for maximum absorbency. We carefully selected towels that will dry up large spills of water and still offer additional absorbency. We valued two-ply construction over single ply. Two ply towels are tougher, absorb a bit better, and generally last longer. Also, when maximum strength is needed, it pays to opt for nylon/cotton blends for towels even though you will lose a bit of absorbency for added durability.